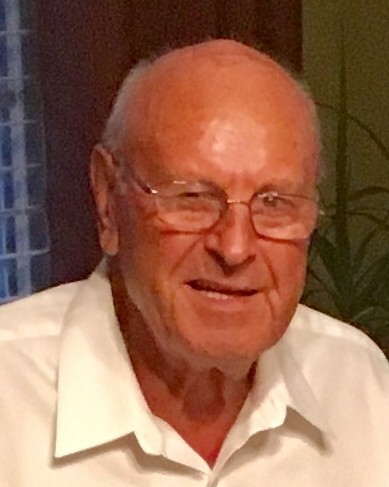 Sime “Sam” N. Mustac, 81, passed away peacefully at his home in Atlantic Highlands, NJ on March 25, 2019. He was born in Privlaka, Croatia to the late Nikola and Grgica (Pavlovic) Mustac. In 1965, he immigrated to the United States where he resided in Clifton and proudly became a US citizen in 1969. He had a fulfilling career as a painter at Hoffman La Roche in Nutley, NJ moving to Pompton Plains in 1978 where he raised two children. He opened his own successful business in 1986, “Sam’s Painting Service”, where he did an amazing job transforming homes all over NJ with his hard work and painting talents, passing on his knowledge and strong work ethic to his children. Retiring from painting in 2008, he decided to move from Clifton to be closer to his daughter and family in Fair Haven, NJ, enjoying many Sunday dinners and spending time with his grandchildren. He loved being around people and was very active. He became a Fair Haven crossing guard as well, where he loved chatting with the children and anyone walking by. Sam loved to dance, tell great stories and make people laugh. He enjoyed sitting on his favorite bench in Pier Village soaking up the sun and people watching. He is predeceased by his parents, two brothers and one sister. Sam is survived by his daughter and son in law: Sharon and Gary Patterson; son and daughter in law: David and Angela Mustac; his brother and sister: Vinko Mustac and Ivana Glavan as well as 4 grandchildren: Ryan and Nicole Patterson and Bella and Lucas Mustac and many loving nieces and nephews. Visitation will take place at the John E. Day Funeral Home 85 Riverside Avenue Red Bank, NJ 07701 from 10AM to 2PM on Saturday March 30, 2019 with a funeral home service at 1:30PM. All other arrangements are private. In lieu of flowers memorial donations can be made to Clean Ocean Action (cleanoceanaction.org). Please visit Sam’s memorial website at www.johnedayfuneralhome.com.